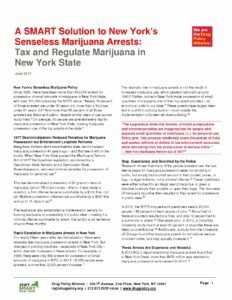 Since 1996, there have been more than 800,000 arrests for possession of small amounts of marijuana in New York State, with over 700,000 arrests by the NYPD alone. Nearly 70 percent of those arrested are under 30 years old; more than a third are under 21 years old. And more than 85 percent of all those arrested are Black and Latino, even though whites use marijuana at higher rates. New York must move beyond prohibition to address the damage being done to communities across the state who have suffered from marijuana prohibition and its collateral consequences.